I don’t deserve any credit for this accomplishment. I didn’t invent the technique, nor, as I mentioned, did implementing it ask much of me. I can, however, vouch for its effectiveness. I was introduced to this magic bullet by an acupuncturist, and I have an acupuncture theory on why it’s so beneficial, but getting acupuncture is not required. This solution to better posture is something you can do completely on your own, anywhere, anytime, without ever opening your wallet. You don’t even have to get up from the couch. Turn up your palms. That’s it. As in the picture above, whenever you’re doing something that does not require use of your hands, turn them so that they’re palm-side up. You also can do it while standing or walking. This palms-up position may be familiar to committed meditators and yogis who practice shavasana, but it’s foreign to those of us who spend a lot of time at a computer, behind the wheel of a car, holding babies, making lattes, or doing pretty much anything else that requires constant hand use. Even when we’re not using our hands, it’s just habit to sit, walk or stand with our hands facing down or behind us. Because we’re so unaccustomed to the palms-up position, when we assume it, the effects are felt immediately. There’s a sense of momentum carrying the upper body backward opposed to the hunched forward motion we so naturally fall into. It feels as if someone is gently pulling back on your shoulders. Try it. If you’re using your hands, stop and rest them against your thighs. Now turn both palms so that they’re facing up toward the ceiling. It sounds simple, but I’m telling you, it works—and fast. I learned this shortcut to better posture while attending a seminar with Japanese acupuncturist Kiiko Matsumoto. Kiiko is known for her eccentric, entertaining teaching style. During lectures, she’ll often diverge from a subject to impart what seems like an irrelevant anecdote. She’s usually halfway through her next thought before you realize the remarkably useful nature of what she just said. At the recent seminar, Kiiko mentioned this palms-up technique quickly and in passing to illustrate a larger point about the rhomboids, the muscles that connect the scapula with the spine. She started using the technique herself after a friend pointed out that Kiiko was developing poor posture. I have been trying it out for the past 10 days. Anytime I don’t need my hands, I turn them palm-side up. If I can get away with using one hand—when reading a book, for example, or walking my dog—I’ll turn the other palm up, alternating hands when the one in use gets tired. I was going to wait to write about this until I spent more time testing it. But in less than two weeks, I have seen a marked improvement in my posture. I’ve also noticed a general feeling of more openness in my chest. It feels easier to breathe. I’ve only been experimenting with it for 10 days, but I suspect this simple palms-up exercise can go a long way toward encouraging movement throughout the Heart, Pericardium and Lung meridians. These pictures show Heart and Lung. Focus just on the solid black line—the one with the orange dots along it—that’s running down the model’s right arm (ignore the lines on the torso as well as the text surrounding the body). 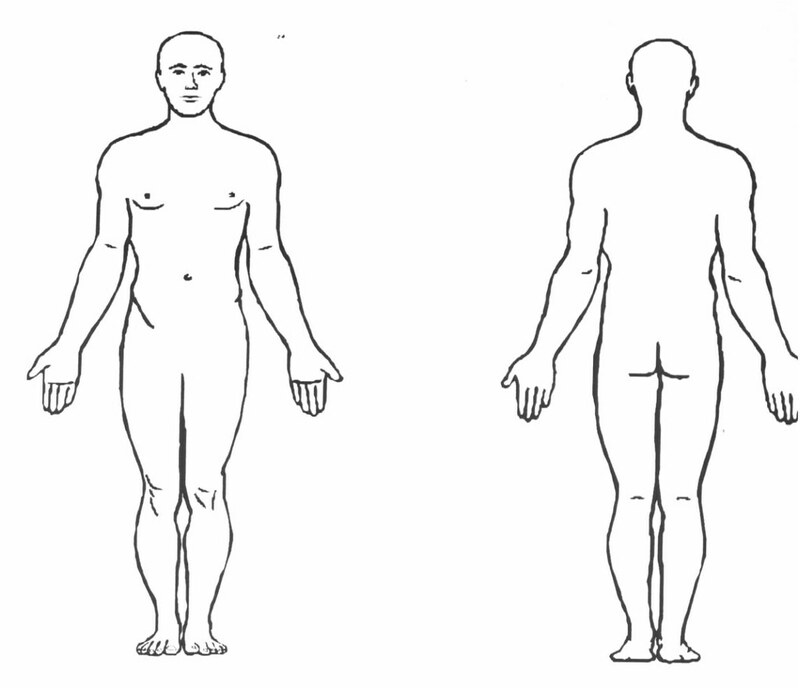 The Pericardium meridian, not shown, runs directly between the two. If you commit to this exercise, I guarantee you’ll notice a shift in your posture. And if my theory is correct, you may notice improvements beyond just sitting up straighter. You can start right now. Just flip your palms toward the ceiling. Definitely need to give this a try- never even occurred to me you could do it while walking your dog. Thanks for sharing, Sara. Hi Ka Hang. It’s crazy how well it works. Actually, I’ve noticed that I especially feel the effects when I do it while standing up/walking. I sometimes get some strange looks from people—cruising down the street in the anatomical position—but the embarrassment goes away after a while 🙂 Let us know if you have success with it! Please explain hand position while walking: Facing forward or toward the sun? Where are my elbows? That’s how I’ve been doing it, at least. It seems like it would require a little more muscular effort but you might try doing it with your palms facing upward toward the sun, elbows bent, to mimic the seated position. I’d be curious to hear if that’s also effective. Let us know! SO!! : What if we created keyboards to use palms up??? No more secretarial carpal tunnel!? Who’s tech savvy for this invention?? Reminds me of the scene in Amadeus where Mozart plays the piano while sitting underneath the keyboard. I’m glad you found it useful, Melanie. Thanks for helping to spread the word. LOL “cruising down the street in anatomical position” – I nearly lost my mouthful there. (Not that I’m eating and reading email at the same time, or anything) Thanks, Sara, I will have to try this. 🙂 No, no. Acupuncturists never eat and email at the same time. Of course not. Thanks for the note, Naomi. Congrats again on that awesome article about your clinic! I love such inventions as an acupuncture practitioner,palm facing up invites the cosmic energy pervading in the universe.In Hindu mythology it has great reference. Hi Sara…. are you actively engaging your forearm muscles to keep the palms straight up? Or do you let your arms relax which cause palms (my palms anyway) to kind of lie at a slight angle? Hey Jon. I’ve been doing it by letting my arms relax but you might also try it by engaging your forearms. Maybe that will work too. For me, I’ve liked the feeling of letting my arms just hang. It creates a natural pull backward without causing any tension anywhere else. Wow! Finally an easy method to remember, and practical too! I just flipped my palms here at my desk and voila…I could feel the difference all througout the upper half of my body. The thing I love about this is that it’s EASY. Why? I’m always using my hands (mainly typing). So if I can think of flipping the palms as a break for my carpal tunnel between typing, then the act of flipping my palms will remind me of my posture, which will remind me to sit up straighter anyway…nice chain reaction. If I find out I have a hard time remembering to do this over the coming days, I may just write the word “palms” on the back of my hand as a reminder. Another simple thing that helps with posture: whenever you can, think about keeping your heart open to what’s going on. It has much the same physical effect as palms-up, and good spiritual and psychological effects too. Especially important when you’re using a keyboard! another reason the palms up tech works is because myofacialy the first three fingers are attached to the chest and bicep. the fourth and fifth are attached to the rhombiods and lats. so when we engage in activities that pronate our hands we develope a stronge dependance on the chest and bicep lines that pull the scapula away from the spine. by making sure we use the fourth and fifth fingers when we grasp an object we reestablish a conection to the scapula holding point be using the rhoboids. this is great for people who use their hands all the time. i love how the blending of body work and acupuncture go together. It could sound as a psychological effect, but I was reading on my bed in a very confortable position as usuall when I decided to flip my palms up and in no time there was a pain in my backbone that made me sit up straight! So… I guess it works! Tks for the tip! Thanks. This is great. I teach exercise, and I am always giving cues about posture. I will try this. Thank you very much for giving me a small place in AcuTake. In just a few hours, I learned new good, educating, health alternative things. Reaching home from the Acupuncture Clinic where our group voluntary give free therapies, acupuncture, cupping, moxa, and hilot-pinoy, all I want is to lay down, stretch my back, and fall asleep, without noticing it. But now, after reading your post, I will surely do first this exercise. I will copy and reproduce your post to be distributed among our patients and community. Awesome!!!!! Thank you so very much. I did it and was amazed to feel the effect almost instantly as I was sitting at the computer reading your blog. Up I sat and chest opened. Plus with William’s post I have hope for my rock tight back muscles so my angel wings can again be released! Will use and share. Blessings be. I have been running with my palms up for 30 plus years and now they’d call it Chi running? I am now 70 years old and my knees and hips are fine. I have tried to convince others but to no a veal . try it you will like it. I happen to read a yahoo book 40 plus years ago and also am an avid runner so some time maybe 30 years ago on a long run I got bored and started doing some deep breathing along with running with my palms up. I have been doing it ever since and now they call it ” Chi Running” and charging people $500 to learn how to do it when all it takes is to turn your palms up as this article states. I have tried to convince my friends to try it but they all think it is nothing but BS. All I know is it works for me and I have been running injury free for 40 plus years. Try it and see! Certain celebrities do this whilst walking and posing on the red carpet. Turning their hands forwards rotates the shoulders backwards for a better posture. This method has been known in eastern meditation for a very long time. Stimulation of HT, PE, & LU. meridians brings a big change in a person, mentally and physical. Watching a film many years ago I saw an eastern man clap his hands together a few times before performing an amazing healing on someone. I found out years ago that if I slapped my hands together hard a few times the put them close together I could sense a definite feeling of energy flowing between the finger tips. After that I found that my HT LU PE pulses had strengthened. So experimenting still I continued to put either my first or second finger tip lightly on a a different acupuncture point and found that the flow of energy from that finger tip stimulated that particular pulse. Also it brought a change in a physical condition., and without telling a patient what I was doing I performed the same method to bring change to the pulses of a patient, and it worked. It’s worth trying. I have used it successfully on myself for years. There are many things that medical science still doesn’t understand. And when one thinks about it. When we have been taught to put our hands together in prayer, are not once again stimulating the HT. LU AND PE/ Sanjiao. I have been retired now for 20 years, but did acupuncture for 25 years. Could you post the walking position again? It goes to an error page. Woke with a headache and, in checking my fb notifications saw this article first thing. It’s already helping! I’ve always had terrible posture. Sara, this is a great article and a reminder of a practice that is very simple and effective. I am passing it to my patients as well. Thank you.